Serving Pottstown, PA and The Tri County area. After more than 20 years together and 14 albums, Black 47, a New York based Celtic rock band, still has a lot to say. "Where did the time go?" front man Larry Kirwan mused. Black 47 plays between 100-125 gigs a year and gets particularly busy around St. Patrick's Day. "We're a working band," Kirwan said, "and we find our own way the more we play together." A Black 47 show is like a big party where the band blends elements of punk, hard-rock, traditional Irish music and even hip-hop. Their latest songs get tested out during concerts. "The truth is that this band always plays better when we have a new album out; it's just more fun on stage," Kirwan said. The new album, "Bankers and Gangsters," is a departure from their last album, "IRAQ," a concept album about soldiers in Iraq. "I was free to let my mind wander on this one," Kirwan said. "I really wanted to feature the band on this album and try to capture our live sound." Kirwan said that the album was recorded in two days. "We're a live band," he said. "We play the song once or twice in the studio and that's it." Kirwan produces and hosts Celtic Crush for SiriusXM Satellite Radio, and he pines for the early rock n' roll days. "I find it hard to listen to the radio anymore," he said. "I can't remember the last time I turned it on and was floored by what I heard. Everything's so polished now. There was a time when you'd turn on the radio and you'd hear rock n' roll; you might hear a few mistakes, but there was a spark there." 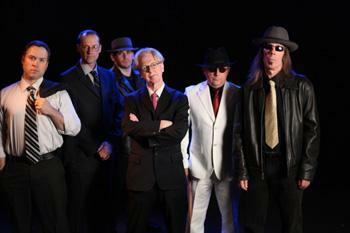 Aside from Kirwan on vocals and guitar, Black 47 includes Geoffrey Blythe (former Dexy's Midnight Runners) on tenor and soprano saxophones, Fred Parcells on trombones and penny whistle, Joseph Mulvanerty on uilleann pipes and flute, Joe Burcaw on bass, and drummer/percussionist Thomas Hamlin. "The subject matter of the songs is disparate," Kirwan said, "but there is a unifying theme in the sound — there's a lot of loud brass on this one." The lyrics and album art show Kirwan's sense of humor. 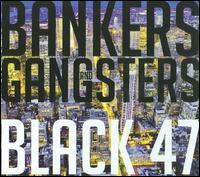 "There was some black humor on IRAQ, but there's definitely more humor on Bankers. These financial guys messed up so many people's lives. I just wanted to bring some bit of humor about it all." Kirwan who grew up in Ireland but has been living in New York since 1975, writes constantly. In addition to "Bankers and Gangsters," his third book, titled "Rockin' The Bronx," was published a week after the CD release. The book's central characters come from a Black 47 song, "Blind Mary/Her Dear Old Donegal (Sleep Tight in New York City)." "Blind Mary" is about a young man in Ireland whose girlfriend has moved to the Bronx and is living there under shady and mysterious circumstances. "The book is about the guy coming to the Bronx to look for her and what he finds when he gets there," Kirwan said. "It's set in the North Bronx between 1980-1982, when there was a large population of Irish living there." The story, as many of Kirwan's stories are, was inspired by actual events. "There used to be 20 to 30 bars within a quarter-of-a-mile radius in that section of the city. I did four one-hour sets a night there. I knew that setting very well. It was a vibrant time."